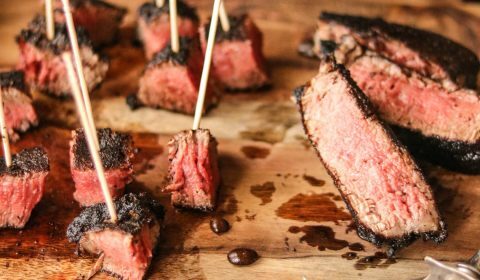 Coffee crusted steak bites, yep, you heard me right. If you haven’t tried a coffee rub on your steak you are missing out on amazing flavor. I first introduced this coffee rub recipe in my coffee rub prime rib recipe for Christmas dinner a few years ago. This rub creates so much flavor I could eat it for days. You don’t really taste the coffee itself, but you’ll definitely be coming back for more. 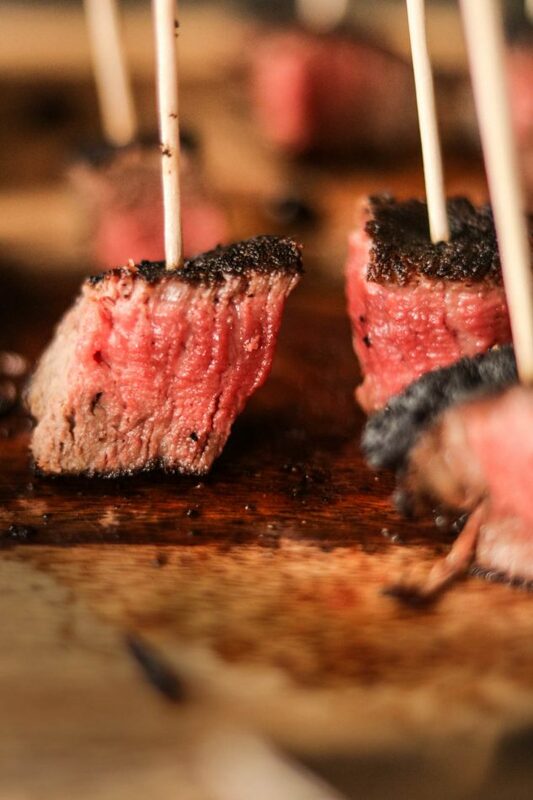 For these steak bites I used filets in order to get the most tender portions of meat. As you can see in the picture, I also like my steak medium-rare, so if a more well-done steak is your preference, feel free to adjust the cooking time. 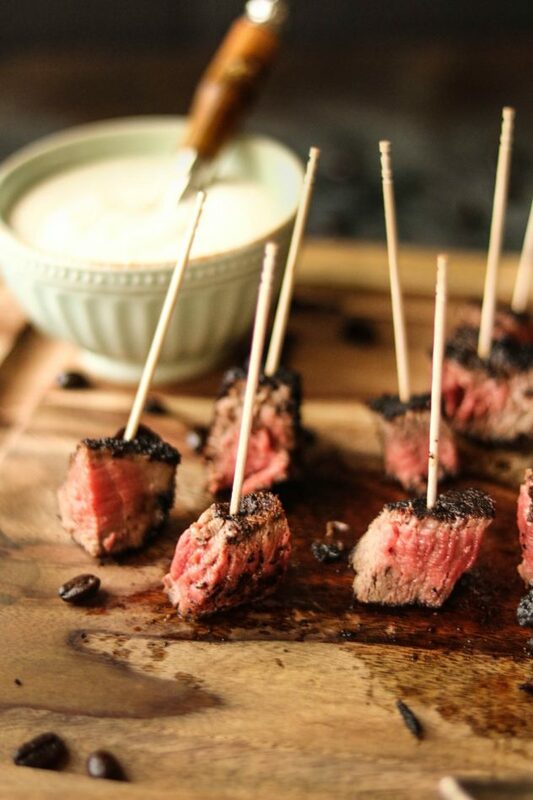 I also paired a homemade horseradish sauce with these coffee crusted steak bites, which was also introduced with the coffee rub prime rib recipe. 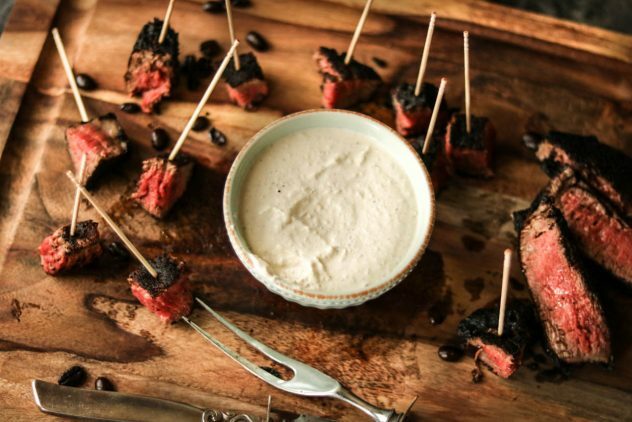 There’s just something about a creamy horseradish sauce paired with this rub that creates the most amazing flavor. This homemade horseradish sauce is also so good that I found myself finding excused to eat it with everything, chicken, bread, you name it I was pairing it with it. Just look at that crust on that steak. Mmmmm perfection. To get this crust you’ll want to cook the steak fillets in a cast iron skillet on the stove, then place into the oven for just a few minutes until you reach your desired temperature. One note of warning, cooking steak inside on a cast iron skillet will produce a lot of smoke, so be prepared. I always like to warn my readers because it can be a little overwhelming if it’s not expected. However, it’s all well worth it in the end. Before starting on the steak, combine the horseradish ingredients in a small bowl, stirring to combine, and place in the refrigerator until time to serve. In a small bowl, add the coffee rub dry ingredients and mix to combine. Heavily coat all sides of each fillet with the dry rub. Preheat your cast iron skillet over medium-high heat. Add butter to skillet and let melt. Place the steak fillets into the heated skillet and cook until a crust has formed on each side, about 1 minute per side. Place the entire skillet into the preheated oven and cook until they reach the desired doneness, about 4-5 minutes for medium-rare. Using tongs, flip the steaks about half-way through. Remove from oven and let rest for 3-5 minutes. Cut each fillet into small bite-sized chunks. Add serving toothpicks to each bite, then serve with the homemade horseradish.